“Working from Memory” contemporary figurative painting. acrylic on canvas. 18 in x 14 in. I wanted to paint an imaginative painting of the Greenville bridge, but I had nothing to work from because I am living in exile in Atlanta. I searched through Google Images for a picture that would jog my memory, and I learned that a new bridge has been proposed to replace the old Greenville bridge and that it is now under construction. Things change when you don’t come home for ten years at a time. It is difficult to work from memory with no model, but I am learning more about how landscapes and other images are constructed, contrast, lighting, etc. It seems the less I have to go on, the more naturalistic I try to make the painting. It’s almost like I need to create one painting as naturalistic as possible and use that as the model for a second more imaginative painting. 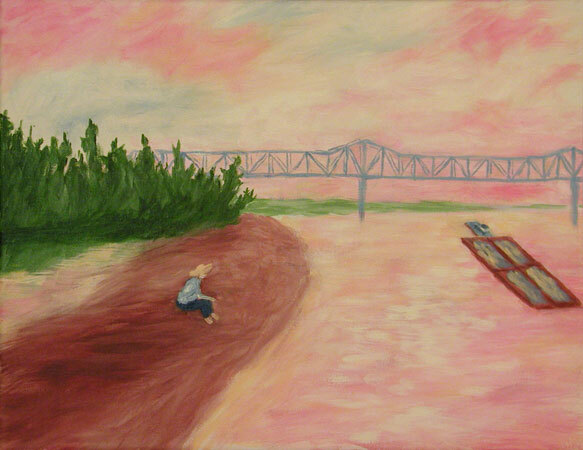 One of the main reasons I started thinking about the bridge is that I want to paint a picture of my mother’s Uncle David looking out at the River. Tom followed his mother out into the carport and pulled the back door closed behind him. He walked around to the passenger side, taking care not to brush his backside up against the sawdust on the table saw or the stack of plywood in the corner, and got in the car. Tom’s mother got in the driver’s side and dusted a cobweb from the leg of her pants. Then she leaned over and placed the covered casserole dish in his small lap. “Now don’t let it spill,” she said. Tom could smell the onions and cheese and feel the heat of the dish through his jeans. It was almost too hot for comfort. Tom’s mother started the car with a heavy revving of the accelerator, adjusted the rear-view mirror and turned on the headlights. As they backed slowly from the carport, Tom watched a toad hop for cover behind a cardboard box covered with cobwebs. “I swear. I don’t know why your daddy can’t throw some of the junk away,” Tom’s mother said. Tom’s mother backed the car down the driveway and onto the short gravel road that ran between the tree-less front yard and an overgrown field. Overhead the sky was a faint orange and pink pastel, a fading twilight. The sun had gone down, but it was not quite dark yet. Tom could see past the shed at the end of the yard and into the field where the weeds were taller than he was. There were some rusting tractors in the weeds and a green truck with no doors. A yellow tom cat was sitting on the seat of the truck looking out. As they drove past, the cat suddenly shot from the seat and disappeared into the weeds. Tom’s mother drove slowly, avoiding potholes. They passed an ancient cypress tree and the old billboard that said “Holiday Inn” and finally came to the end of the gravel drive where it met the highway. Tom’s mother stopped and waited for a diesel truck to roar by and then pulled out onto the highway. She accelerated quickly and then changed lanes to avoid a pickup pulling out from the trailer park across the highway. The wind whistled through an unseen gap in the window beside Tom’s head. The sound was annoying, but the hand crank was missing and it could not be rolled shut. Tom ignored the noise and adjusted his legs beneath the casserole so that his feet rested on a jumper cable coiled in the floorboard. “Momma, why are we going to Nanna’s?” Tom asked. They followed the highway through the endless fields of cotton and soybean that stretched flat and treeless to the dim horizon. Occasionally, they passed solitary mobile homes and shacks. Some were surrounded by Johnson grass as tall as a man. Others had yards where grass never grew, where the bare gumbo mud was packed smooth and hard as concrete. In the yard of one mobile home, a dog had cornered a cat or something underneath an old car. On the other side of the yard, a boy of about fiver years of age stood between a pile of old tires and hub caps and a 55-gallon barrel of burning garbage. The boy waved at them as they sped by. They drove on past the shack, past a cypress bayou where two black men were loading cane fishing poles and five-gallon buckets into the back of a pickup, past even more fields. Then the fields ended, and the houses began. They drove into the edge of town, past the small ugly houses of the men who worked at the plant with his father, past the shopping center, past a grocery store, past neighborhoods of middle-income homes where the shade trees and street lights began. Night was falling quickly now, and the street lights were just starting to come on. Then they passed the road which led to Tom’s grandmother’s house. “Is Granny going to be there?” Tom asked. They came to a stoplight where they turned off onto a smaller residential road. This road ran behind the neighborhood where the rich people lived, the doctors and lawyers. On either side of the road, the lights from tennis courts and swimming pools peeked from behind the hedges and brick fences covered with ivy. Then they turned again, down an avenue of great big oaks, where the windows of grand houses spilled golden light onto azaleas and magnolia trees. Tom caught a glimpse of a baby-grand piano underneath a sparkling white chandelier. The wallpaper of the room was blood red. “Momma, is Nanna rich?” he asked. “Now where did you hear that?” his mother said. Tom looked out the window at the houses. They all looked like the houses in the magazine in the dentist’s office, no trash anywhere, all the grass neatly mowed. Near the corner a black man walked in the shadows. “I wonder what he’s looking to steal,” Tom’s mother said. Then she turned the corner and slowed the car to a stop in front of a large two-story house, an old Victorian with large pointed gables and a porch that ran all the way across the front of the house and down one side. The entire house was dark except for the naked bulb of the porch light and one downstairs window, which glowed a dull orange. Tom couldn’t ever remember being there before, but he knew that this was great grandmother Nanna’s house. Tom’s mother lifted the casserole from his lap and they got out of the car and walked up to the house. June bugs and moths swarmed around the porch light. Tom pointed to the doorbell, but his mother swatted at his hand. “She might be sleeping,” she said and rested her knuckles on the door wondering what to do. Before she could knock, a strange woman opened the door and said, “You’ll have to be very quiet. She just went to bed.” Her voice was not friendly, and the way she just stood in the doorway made Tom wonder if they were really supposed to be there. Then the woman stepped back away from the door and led them into the living room. Aunt Tracy was there, and it surprised Tom to see the familiar face in the strange house. Aunt Tracy smiled at them but didn’t say anything. The woman took the casserole from Tom’s mother and went back into the kitchen and shut the door without saying anything else to Tom’s mother or Aunt Tracy. Tom’s mother leaned toward Aunt Tracy and mouthed a question. “Mrs. Frank,” Aunt Tracy whispered. Tom’s mother rolled her eyes. Tom sat in the corner between the fireplace and a table with lion’s feet. On the table was a stuffed red parrot in a glass box and an urn with naked devils on it. Tom’s mother stood in front of the sofa with Aunt Tracy. They did not sit down, and even through it was summer, they both had their arms folded as if they were cold, and they spoke in the lowest of whispers. “What happened? Do they know yet?” said Tom’s mother. Then there was a knock at the door. Aunt Tracy peeked out the window and then opened the door. It was two men in police uniforms. One of them was Uncle Johnny, her husband. Uncle Johnny told the other policeman goodbye and thanks for the ride and shut the door. He winked at Tom and hugged Tom’s mother. Aunt Tracy hugged him and then refolded her arms. “Did they find out anything else?” she said. “What happened?” Tom’s mother said. Then it was quiet for a moment, so quiet that Tom could hear the ticking of a clock somewhere in the hall. Aunt Tracy leaned over and began to poke through a stack of old black-and-white photographs on the coffee table. She found one of a man in uniform and picked it up. “I suppose this is going to be all in the paper,” said Tom’s mother. “What about that other fellow?” said Aunt Tracy with obvious disgust. “That’s the kind of people they get mixed up with,” said Uncle Johnny. “Wasn’t he the one that he met in the Marines?” asked Aunt Tracy. “No, you’re thinking of old what’s his name, lived over on Washington Avenue,” said Uncle Johnny. “Marines? I always thought he was in the Navy,” said Tom’s mother. “No, that’s the uniform of the Marine Corps,” said Uncle Johnny pointing to the photograph. Tom’s mother chuckled and started to say something about Uncle Bill going overseas. That was when they all noticed the old woman standing in the doorway. The old woman’s hair was thin wisps of white, almost bald. Her face was stained and bloated from days of crying, her eyed red. She held a ratty blue robe tightly clenched with one hand around her neck. The old woman shook her head. She was angry. “Please don’t be saying things about my boy. He’s gone now.” And then she started to cry. It was sobs at first, then turning to a low shuddering moan. Mrs. Frank came in from the kitchen and put her arm around the old woman and led her back down the hall. Within seconds, Mrs. Frank reappeared from the darkened hallway. “I’m putting her to bed for the night,” she said. Then she turned off the lamp and went back down the hall. A few minutes later, they heard a door shut and lock at the other end of the hall. Mrs. Frank did not come back. “I guess we should go now,” said Uncle Johnny in a low whisper. Uncle Johnny opened the door and they walked out onto the great front porch, which was all in shadows, and down the steps, across the lawn and to the street. Uncle Johnny and Aunt Tracy got in Aunt Tracy’s car, and Tom and his mother got into their car. Tom’s mother waved goodbye to Aunt Tracy and started the engine. Tom’s mother sighed and turned the steering wheel hard to the right. As they made the corner, the headlights of another car momentarily lit up her face then disappeared and it was dark again. They rode in silence for a while, and then they drove past the Kroger and the lights of the shopping center. Tom’s mother turned into the drive-through of the Dairy Queen and bought two chocolate sundaes. Chocolate was Tom’s mother’s favorite. His too. Tom’s mother pulled the car back onto the highway, and they headed out into the dark countryside toward home. As they drove faster, the wind began to whistle through the gap in the window. A few minutes later, the idea of eating ice cream at night gave Tom’s mother the chills, and she had to switch on the heater even though it really wasn’t cold. And it was at that exact moment that Tom knew that he would never drink or smoke or do anything that would make his mother not love him.